This US presidential election campaign is one of the most controversial and unconventional in recent history, and it’s playing out against a backdrop of anemic economic growth and rising geopolitical uncertainty. To win the race to the White House, Democratic nominee Hillary Clinton and Republican nominee Donald Trump are making the usual campaign promises, ranging from drug industry pricing reform to renegotiating the North American Free Trade Agreement (NAFTA). How many of their promises can be chalked up to campaign rhetoric, and which ones might stand a chance of being implemented when either candidate reaches the Oval Office? 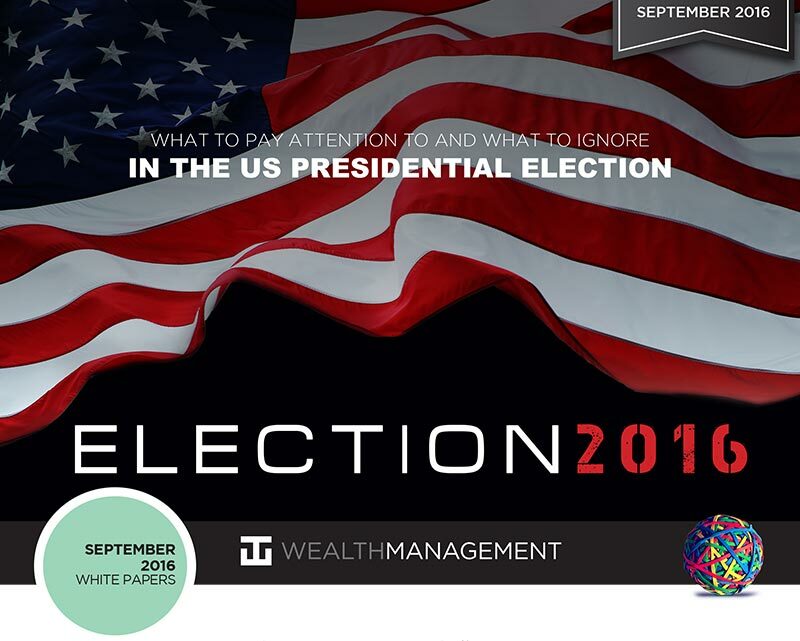 This month’s WT Wealth Management White Paper explores some thoughts on how this US presidential election might play out, which campaign promises ring hollow, and which ones might actually have an impact on investors come 2017. July’s Democratic and Republican national conventions let investors hear the candidates outline their respective platforms and proposed policies. Now, Hillary Clinton and Donald Trump are on the road, expanding on these ideas and trading blows up via social media and through surrogates. With Election Day now less than two months away, policy promises are flying fast and furious. Some may stick; others may not. The nightly news highlights both presidential campaigns as they stump hard on particular issues. While specifics may change before November, the proposed policies could have serious implications for numerous sectors - particularly healthcare, energy, and such infrastructure - related sectors as industrials and materials. Hillary Clinton wins modestly. This scenario is the most likely, and one it appears the market can live with. The House would likely stay Republican - which is important for markets - and the Senate may remain Republican as well. This would be an easy transition, as the market has lived with a divided government for eight years. not be quite as popular with the markets. Donald Trump wins. While this scenario seems increasingly unlikely, based on recent polls, it is not out of the question. If Trump were to win, chances are the House and Senate would likely stay Republican, but the markets would have to worry about uncertainty, which they hate. Many believe a Trump presidency could mean anxiety around a possible trade war with China, potential conflicts with the Federal Reserve, and panic over how Trump would pay for programs he is proposing, such as tax cuts and infrastructure spending. We hear a lot of tough talk on the campaign trail, but it’s hard to know what is rhetoric and what might have a chance of being implemented once a candidate takes office. Let’s examine some thoughts on this, regarding Hillary Clinton’s campaign. Let’s start with the drug sector. Part of the Democratic Party’s 2016 platform calls for limiting price-gouging by drug companies and capping prescription-drug costs. Hillary Clinton has specifically spoken about cracking down on prescription-drug pricing, and many believe the drug sector would have to worry if she won, because she could follow through on those promises. This could cause the drug and biotech sector to come under pressure - a reality the industry faced in September 2015 when Clinton tweeted about price-gouging and biotech stocks promptly fell more than 4%. However, other health care sectors - hospitals, nursing homes, etc. - might do well, given her support of the Affordable Care Act. Trump has not made the same vow to stymie drug-pricing, so this is one area of healthcare his policies may not touch. However, his plan to repeal the ACA could indirectly impede drug sales if the number of insured Americans drops and directly frustrate hospitals and health-insurers. Regarding the defense sector, many experts have a contrarian view to the public’s. Some believe Clinton is far more hawkish and pro-Israel than President Obama, and a Clinton presidency could be better than expected for defense sectors. Given her tenure as Secretary of State and her deep knowledge of foreign affairs, some believe the foreign policy establishment will rally behind her and she could spend aggressively on defense. What about the energy sector? The Democratic Party platform calls for getting 50% of US electricity from clean sources within a decade and half a billion solar panels installed within four years. A Clinton administration would be quite negative for coal, and her rhetoric on fossil fuel supports that thesis. However, experts believe it would be positive for alternative forms of energy, which she has vocally supported. Clean energy has been a pillar of her platform, and she has voiced her desire to turn the US into a “renewable energy superpower.” Wind, solar and hydropower firms may stand to benefit if Clinton wins, as could firms that promote use of clean energy. While Clinton may be a negative for fossil fuels, Trump would be a big plus. Clinton apparently wants to reduce the US’s carbon footprint, while Trump wouldn’t mind if it expanded. The expectation is that Trump would boost the fossil fuel sector, which Republicans view as key to economic growth, and Trump has pledged to eliminate the Environmental Protection Agency, repeal the Clean Power Plan, support the coal industry, block the carbon tax, and reject the Paris Climate Agreement. Trump has also voiced support for finishing the Keystone Pipeline (which Clinton denounces), and the infrastructure spending for this type of project could benefit service and equipment firms. What should investors make of talk of the need for regulatory reform and a crackdown on banks? Many analysts also have a contrarian view here. Under Clinton, many believe banks would worry about smoke but not fire: while campaign rhetoric promises a crackdown on banks and a revision of Glass-Steagall, many believe those promises are hot air. It seems farfetched to see this type of legislation getting through what is right now a very conservative House of Representatives. With Clinton as president, analysts insist that big banks on Wall Street will do just fine. Are we really going to get rid of carried interest? Politicians have proposed this idea for 20 years, and it has never happened. Most also don’t believe we will see a transaction tax on Wall Street. Wall Street would move to Singapore if such a tax were implemented. Many business owners are struck by her campaign’s anti-business tone: she talks of protectionism and takes a negative view of free trade. On the campaign trail, Clinton talks a lot about taxes, including clawing back tax breaks for companies that ship jobs overseas, eliminating tax breaks for big oil and gas companies, and cracking down on ways for companies to evade taxes. This anti-business tone comes through in Trump’s campaign as well, especially his extreme talk of protectionism and his very negative view of free trade. It’s an odd environment right now for business. I’m torn as to whether it’s rhetoric or it’ll translate into something meaningful under the next administration. While Trump has said he will pull the US out of NAFTA, most believe that undoing NAFTA is a hollow promise. The public gets too many benefits from NAFTA, such as cheap goods. This is why Democrats have pledged to do more in terms of worker training and assistance to address voter concern that NAFTA has cost the US well-paying jobs. I can’t see us turning our back on NAFTA, although maybe a renegotiation would benefit the United States. What does worry many experts regarding trade is Trump’s promise of a trade war with China. He could do so without Congressional approval, and analysts do worry about Trump getting provocative with China. The markets would not be pleased to see a trade war between the world’s two largest economies in 2017. Tax reform is at the core of the Republicans’ growth plan. Trump talks of lowering taxes and the US debt. While Trump talks about these issues, he has not outlined how he will pay for any of them. When asked, he says he is going to cut “waste, fraud and abuse,” which is a cliché - usually an indication that the candidate has no concrete plan to cut spending. Regarding tax reform, one area where the stars could align in 2017 would be that Clinton and Trump could both be catalysts for tax reform. This might include repatriation of US corporate profits stashed abroad, which could be a huge story for drug and tech companies. It could also be a huge plus for infrastructure, which may benefit from an influx of government spending earmarked for infrastructure improvements. Increased fiscal spending and infrastructure investment sees common ground between the candidates. An interesting theme is emerging from both candidates: increased spending and decreased adherence to fiscal restraint. 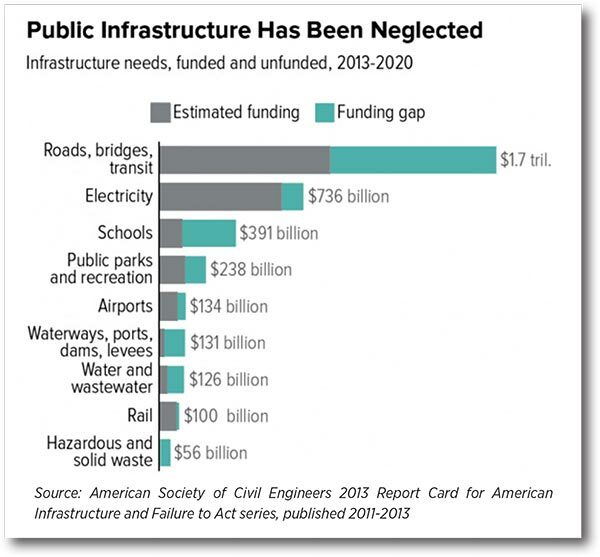 Increased fiscal spending could be largely conducive for transportation and infrastructure investment. Rebuilding America’s bridges and roads has been a key theme throughout the election season in both presidential campaigns. Clinton calls for $275 billion in infrastructure spending in the next five years, plus $25 billion to establish an infrastructure bank. Trump has stated that he will at least “double” that amount. He has also proposed infrastructure bonds, and setting up an infrastructure fund to repair bridges and build roads. There is also support for increased transportation investment from both sides of the aisle on Capitol Hill. Republican House Speaker Paul Ryan and Democratic Senator Chuck Schumer’s attempt to broker a major infrastructure deal adds support to the candidates’ pro-infrastructure agendas. Any increase in infrastructure spending could benefit materials companies, as well as industrial firms with the machinery to engineer large-scale public works projects. What’s next for investors and the US presidential election? For the next two months, campaign promises, hollow or not, will shape investor sentiment and could have a larger impact on the market. We know that healthcare, energy and infrastructure are staples of each candidate’s policy reforms. But what about financial regulation, social issues, defense, taxation, labor and trade? Trump is quite resolute on how he will approach trade, but the devil is in the details. As November approaches, we should get a clearer view on these proposed policies, and on which candidate will be sitting in the Oval Office to follow through on them. Carried Interest: A share of any profits the general partners of private equity and hedge funds receive as compensation, whether or not they contributed any initial funds. This method of compensation seeks to motivate the general partner (fund manager) to work toward improving the fund’s performance. Glass-Steagall: The Glass-Steagall Act, a.k.a. the Banking Act of 1933, prohibits commercial banks from engaging in the investment business. Congress enacted it as an emergency response to the failure of nearly 5,000 banks during the Great Depression. NAFTA: The North American Free Trade Agreement (NAFTA) is an accord among the US, Canada and Mexico designed to remove tariff barriers among the three countries. Transaction Tax: A levy placed on a specific type of monetary transaction for a particular purpose. The concept has been most commonly associated with the financial sector but does not usually include consumption taxes paid by consumers. NASDAQ Biotechnology Index: This is designed to track the performance of a set of securities listed on the NASDAQ Stock Market® that it classifies as either biotechnology or pharmaceutical, according to its Industry Classification Benchmark. S&P 500 Health Care Sector Index: This includes companies from the following industries: pharmaceuticals, healthcare providers & services, healthcare equipment & supplies, biotechnology, life sciences tools & services, and healthcare technology. S&P 500 Index: Also known as the Standard & Poor’s 500, this index is based on the market capitalizations of 500 large companies having common stock listed on the NYSE or NASDAQ. The S&P 500 index components and their weightings are determined by S&P Dow Jones Indices. WT Wealth Management is a registered investment adviser in Arizona, California, Nevada, New York and Washington with offices in Scottsdale, AZ Jackson, WY and Napa Valley, CA. WT Wealth Management may only transact business in those states in which it is registered, or qualifies for an exemption or exclusion from registration requirements. Individualized responses to persons that involve either the effecting of transaction in securities, or the rendering of personalized investment advice for compensation, will not be made without registration or exemption. WT Wealth Managements web site is limited to the dissemination of general information pertaining to its advisory services, together with access to additional investment-related information, publications, and links. Accordingly, the publication of WT Wealth Management web site on the Internet should not be construed by any consumer and/or prospective client as WT Wealth Management solicitation to effect, or attempt to effect transactions in securities, or the rendering of personalized investment advice for compensation, over the Internet. Any subsequent, direct communication by WT Wealth Management with a prospective client shall be conducted by a representative that is either registered or qualifies for an exemption or exclusion from registration in the state where the prospective client resides. For information pertaining to the registration status of WT Wealth Management, please contact the state securities regulators for those states in which WT Wealth Management maintains a registration filing. A copy of WT Wealth Management’s current written disclosure statement discussing WT Wealth Management’s business operations, services, and fees is available at the SEC’s investment adviser public information website – www.adviserinfo.sec.gov or from WT Wealth Management upon written request. WT Wealth Management does not make any representations or warranties as to the accuracy, timeliness, suitability, completeness, or relevance of any information prepared by any unaffiliated third party, whether linked to WT Wealth Management’s web site or incorporated herein, and takes no responsibility therefor. All such information is provided solely for convenience purposes only and all users thereof should be guided accordingly.